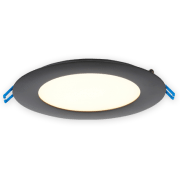 17W Super Thin Recessed Lighting Fixture 6"
1/2″ Thick LED fixture that fits directly under joists. Maximum layout flexibility. 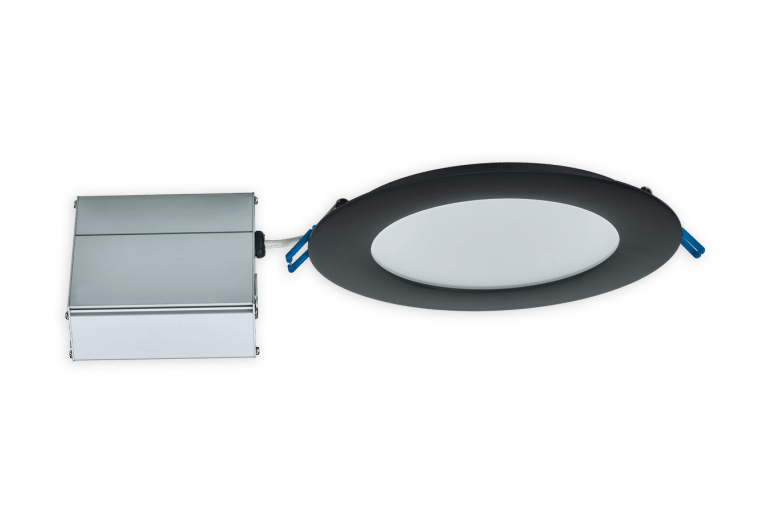 Round 6″ fixtures with integral LEDs. Isolated external driver factory installed inside junction box. 1 1/2″ Above Ceiling Clearance Required For Driver. Suitable for Wet and Damp locations including showers and soffits. Fixture comes connected to the driver by 12″ long low voltage cable with waterproof connector in the middle. Neutral White 4000K is whiter, colder and more energizing light. Using this colour will make the room look white, modern and brighter. We recommend the Neutral White for bathrooms, offices and work areas, garages, kitchens with white or dark countertops and cabinets. Daylight White 5000K is pure white light close to the natural sun light during mid day. We recommend the Daylight White for offices, hospitals, industrial hallways, etc. Dim to Warm 3500K to 2000K model would give you the option of having white light that changes to amber when dimmed to the lowest settings. We recommended it for residential installations. Dim to Warm 2800K to 2000K model would provide soft yellowish light that changes to amber when dimmed to the lowest settings. We recommended it for restaurants.